Do you need multi-part forms? Also called NCR, Carbonless or No Carbon Required Forms. At BEE-BEE Printing (Your Mooresville Printer) NCR Forms are not a problem. The forms come in 2, 3 or 4 part sets. We can get 5 or 6 sheets per set but it has not been requested. If you have your own file or need us to edit or create a new form for you, we can do it all. The forms come glued in sets and can be glued on the top or the side, your choice. Most of the forms we print are printed with black print but we also offer color printing on these forms. If you need single sheet forms, check out our Note Pads page. 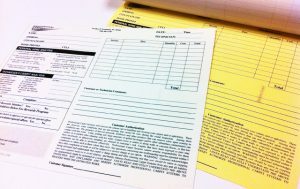 We can print your forms and make a glued note pad with them.